goosie cards | I am JuJu! Another Giveaway from Goosie Cards! I was so thrilled when Jennifer, the owner of Goosie Cards, contacted me to do another giveaway! I LOVE these cards and all the possible ways to use them. 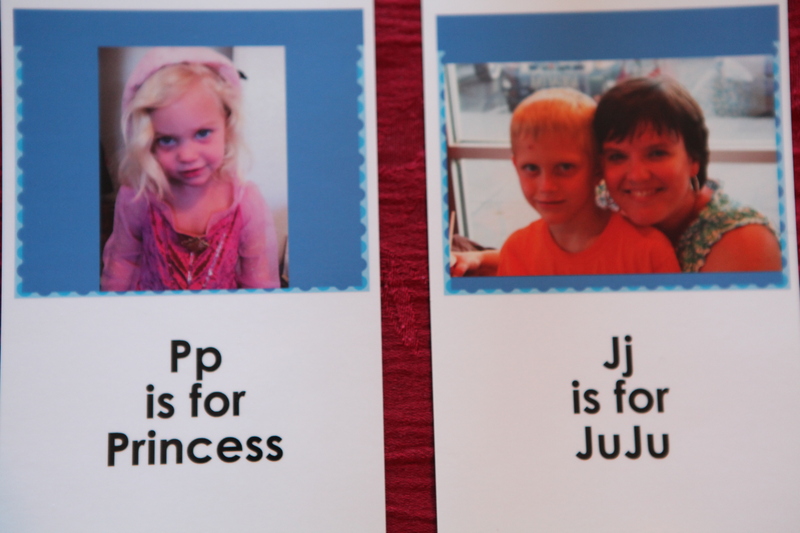 These are the cards that I gave my 2 y/o niece for Christmas. Her’s was an alphabet set. Since gifting them I have thought of multiple ways to use them for my girls. As most of you know, my girls are 11 and 13. I knew I didn’t need to make them cards to learn their alphabets, but I knew that I wanted to make them a set to help them stay on task in the mornings. Both of them need multiple cues to stay on task and I figured that visual cues would be so much better than the constant verbal cues that only lead to frustration. No matter how many times I ask them to do something, I can walk in the room and there they sit, looking dazed and confused. I’m so tired of saying “Did you brush your hair? Did you brush your teeth? Did you make your bed? etc., etc., etc.”!!!! Mornings are difficult for us! So I decided to make a set of cards for both of the girls with personalized pictures. They will include: pick out your clothes, take a shower, brush your teeth, brush your hair, make your bed, and put on your shoes. They will be hole punched, on a ring, & hang on a hook. I had really hoped to have the cards to show you, but alas, this month has been so busy and I just haven’t had a chance to order them yet. I’ve taken the pictures, now I just need to upload them & add the text. Check out the Goosie Cards website for some great new card ideas! These cards are really great for kids of all ages! Alphabet cards, family cards, cards for therapy, etc. These would be great for speech therapists and behavioral therapists! Leave me a comment, here on the blog, to be entered into the drawing for a set of 10 cards! This giveaway is open to everyone, including my international friends! “Like” Goosie Cards on Facebook here and follow Goosie Cards on Twitter here to stay up to date on all their specials, giveaways, and sales. This giveaway will close this Saturday, April 28th at midnight Eastern time. Happy New Year! I can’t think of a better way to start of the new year than with a giveaway! Yay!!! I am thrilled to be giving away a set of 10 photoflash-cards that you will be able to personalize from Goosie Cards to 3 of my fabulous readers! Goosie ships internationally so this is open to ALL of my readers!! When Jennifer, the founder of Goosie Cards, contacted me about doing a giveaway this is what she had to say about the cards: “Our cards are universal and for all children. They are based on the basic principle of visual learning: the first method by which we all learn.” I don’t know about you, but Skylar is totally a visual learner as are many of the children that fall on the autism spectrum. I immediately went to her website to check out what they had to offer. I loved the way they looked on-line but knew that I wanted to have a set in my hands so that I could see the quality of not only the pictures, but the quality of the cards as well. Well let me tell you, these cards are REALLY AWESOME! These are a great educational tool for all children, but I especially loved the therapeutic aspects that these cards offer for children with special needs (sequencing, behavior cards, emotions, etc.). Years ago when we started ABA with Skylar, we purchased a box of cards to use in our various programs. She also had a set of them at school. Oh what I would have given to have cards that were personalized with familiar faces and words to use for her. 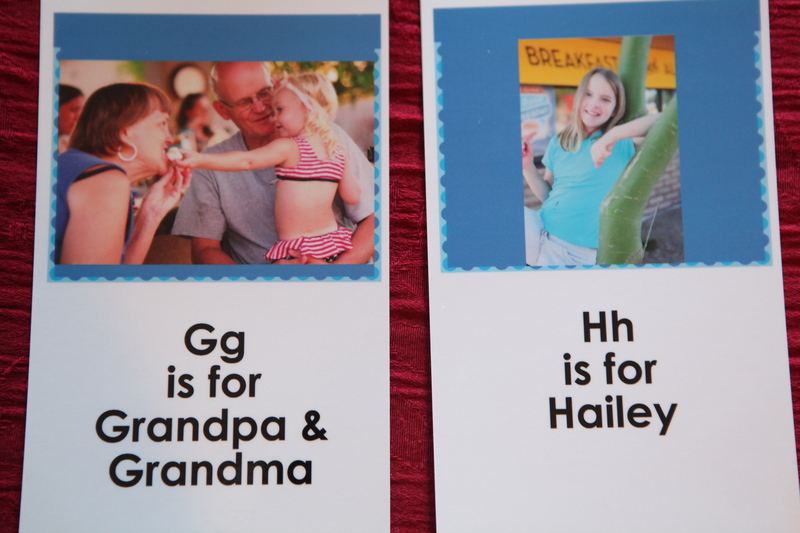 Click here to go to the Goosie Cards website to see all the wonderful benefits of photo educational flashcards. I chose to make a complete alphabet set for my niece, Sam, who is a 2 1/2 year old neurotypical child. The process was pretty simple. Upload the pictures on-line, drag and drop the picture into the card and add the text (up to 5 lines for each card). I had my cards hole punched so that they could be kept together on a ring. She opened her cards on Christmas Eve and absolutely LOVED them. I loved watching her play with the cards and say the names of the people as she saw them. 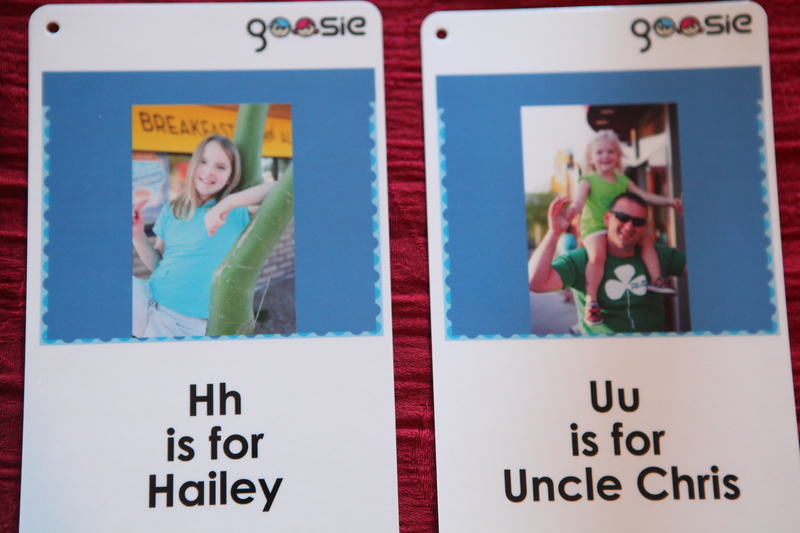 1) “Like” Goosie Cards on Facebook and leave a comment below that you did so. 2) Follow Goosie Cards on Twitter and leave a comment below that you did so. The giveaway will be open until this Sunday, January 8th at midnight Eastern time and winners will be announced here on Monday, January 9th. 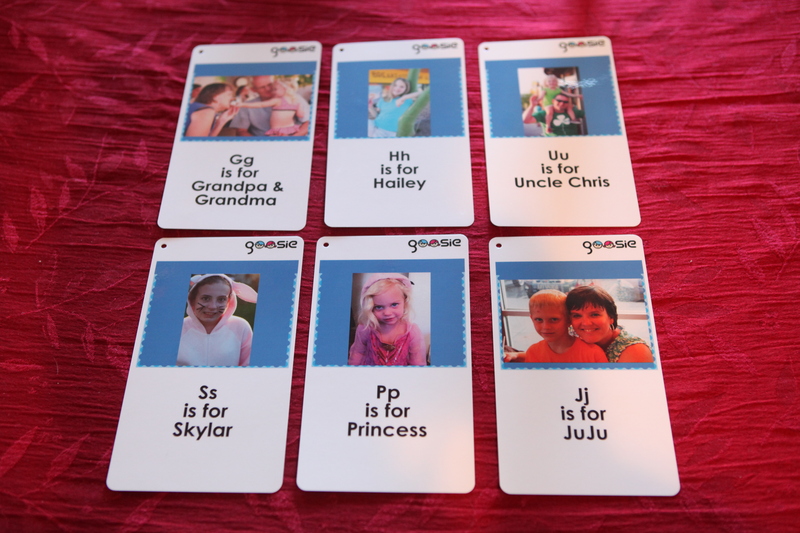 Head on over to the Goosie Cards website and take a look!